A summer flowering herbaceous perennial, native to Southern Africa Agapanthus was brought back to Europe in the seventeenth century by the first European settlers when they stopped off at rthe Cape to replenish their supplies. They are grown for their showy blue or white lily-like flowers displayed on tall succulent stems amongst sheathes of green foliage. 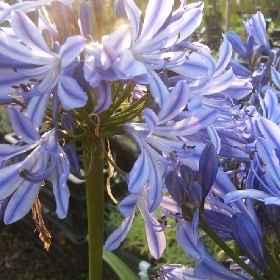 The name Agapanthus is derived from the Greek ‘agape’, meaning love, and ‘anthos’, flower. They require well drained soil and a sunny position either in a border or container. Some cultivars are less hardy as the plants a re also popular in Australia and the southern states of America, where winter survival is not at issue. Choose Agapanthus Headbourne hybrids for a reliable hardy variety.